The Free County of Burgundy (French: Franche Comté de Bourgogne; German: Freigrafschaft Burgund) was a medieval county (from 982 to 1678) of the Holy Roman Empire, within the modern region of Bourgogne-Franche-Comté, whose very name is still reminiscent of the title of its count: Freigraf ('free count', denoting imperial immediacy, or franc comte in French, hence the term franc(he) comté for his feudal principality). It should not be confused with the more westerly Duchy of Burgundy, a fiefdom of Francia since 843. Otto IV, son of Hugh and Adelaide, was the last of the feudal counts of Burgundy. 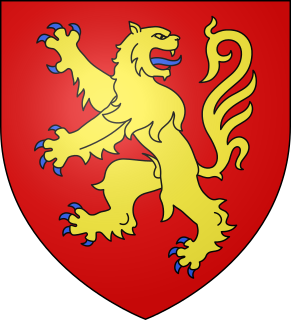 He married first the daughter of the Count of Bar, then the grandniece of King Louis IX of France, Countess Mahaut of Artois. This marriage brought the county under French influence. The daughters of Otto IV and Mahaut, Joan II and Blanche, married respectively Philip V and Charles IV of France, sons of King Philip IV. Jeanne became Queen of France after having been one of the heroines in the Tour de Nesle Affair. In that same affair Blanche was found guilty of adultery and was imprisoned for the rest of her life. After quarreling with his barons, and after a new revolt against the French carried out by John of Chalon-Arlay, Otto IV ceded the county to his daughter as a dowry and designated the King of France as administrator of the dowry in 1295. By marrying their daughter and heir Joan, Duke Odo IV of Burgundy reunited the duchy and the county under his rule, followed by his grandson Duke Philip I. The personal union was again broken after Philip had died without heirs in 1361, when the Duchy of Burgundy was seized as a reverted fief by King John II of France, while the Imperial county was inherited by Philip's great aunt Margaret I, a granddaughter of Count Otto IV. In 1382 she bequeathed her estates to her son Count Louis II of Flanders. Gisela of Burgundy, a member of the royal Elder House of Welf, was Duchess of Bavaria from about 972 to 976 and again from 985 to 995, by her marriage with Duke Henry the Wrangler. She was the mother of Emperor Henry II. The County of Savoy was a State of the Holy Roman Empire which emerged, along with the free communes of Switzerland, from the collapse of the Burgundian Kingdom in the 11th century. It was the cradle of the future Savoyard state. Rudolph III was King of Burgundy from 993 until his death. He was the last ruler of an independent Kingdom of Arles, also called the Second Kingdom of Burgundy, and the last male member of the Burgundian group of the Elder House of Welf. Otto I was Count of Burgundy from 1190 to his death and briefly Count of Luxembourg from 1196 to 1197. He was the fourth son of Frederick I, Holy Roman Emperor by his second wife Beatrice I, Countess of Burgundy, daughter of Count Renaud III. Otto III, a member of the House of Andechs, was Count of Burgundy from 1231 and last Duke of Merania from 1234 until his death.